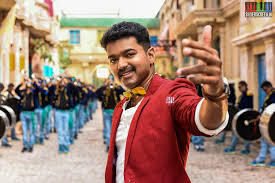 For the fans of Ilayathalapathy Vijay, April 14 is not only the Tamil New Year festival but also the first anniversary of their Thalapathy’s blockbuster ‘Theri’.Directed by Atlee and produced by Kalaipuli.S.Thanu, ‘Theri’ hit the worldwide screens on April 14, 2016 and turned out to be a mega blockbuster of the year. Theaters in Chennai and other places of Tamil Nadu will be screening ‘Theri’ on April 14th which also see three new Tamil releases. A movie hall in Porur, Chennai will be screening the special morning show of ‘Theri’ at 8 AM on April 14.Another theater in Koyambedu earlier scheduled one special show but now due to humongous rush for tickets among Vijay fans the number of shows for ‘Theri’ has been increased to three in that theater.This for a film that was released last year and do we need anything else to show the star power of Ilayathalapathy?